And the winner is … jaw-droppingly gorgeous Pembrokeshire. 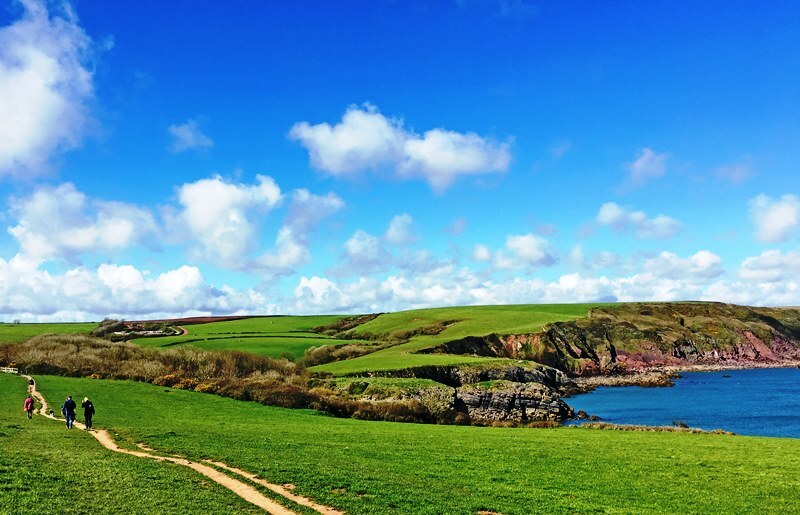 It possesses a glorious, beach-strewn coastline; the Pembrokeshire Coastal Path has been ranked by National Geographic as one of the great hiking paths of the world. It also won BBC Countryfile Holiday Destination of the Year 2018. Medieval castles testify to its battle-scarred history and excellent eateries to its love of good food and drink. After far too many years away, I recently returned to this beautiful part of South West Wales to host the Pembrokeshire Tourism Awards and run a couple of workshops for their members. 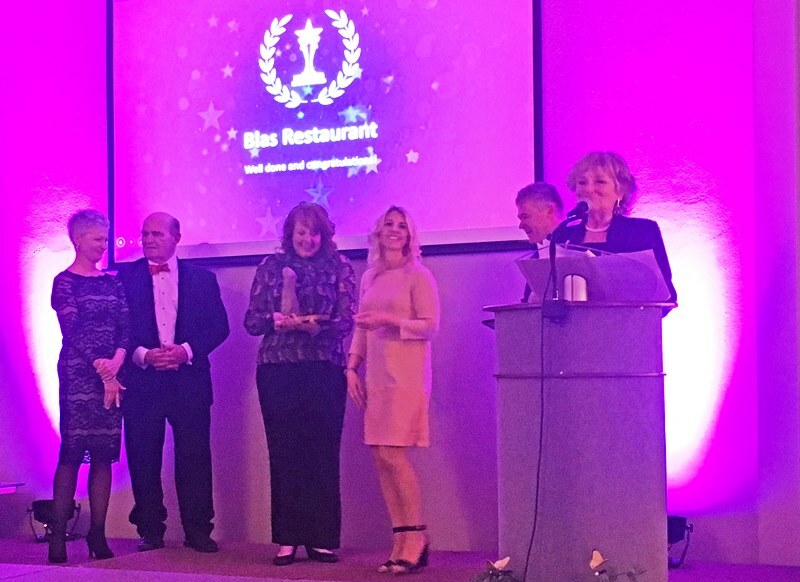 Throughout the Awards night, the very high standard of accommodation, visitor attractions, foodie outlets, activities and commitment to sustainability and the environment was evident in not only the winners but all the finalists. 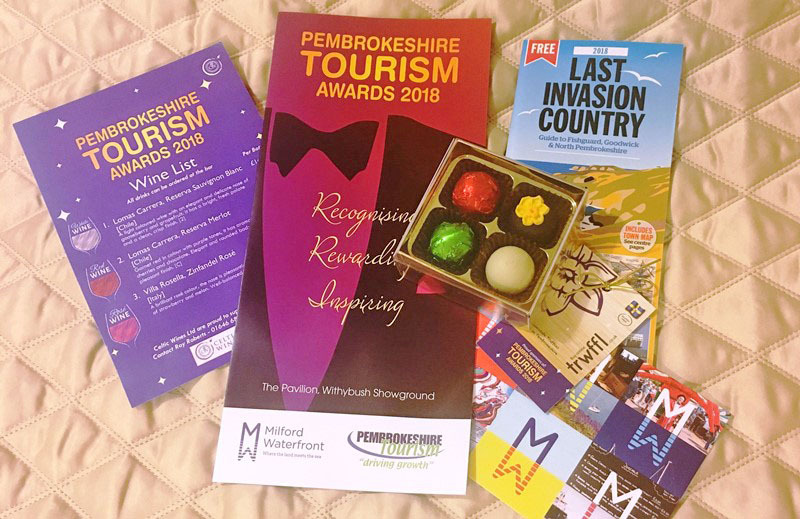 You can see a list of the Pembrokeshire Tourism 2018 winners here. It was a privilege to host the evening and get to meet so many people truly passionate about their lovely county. 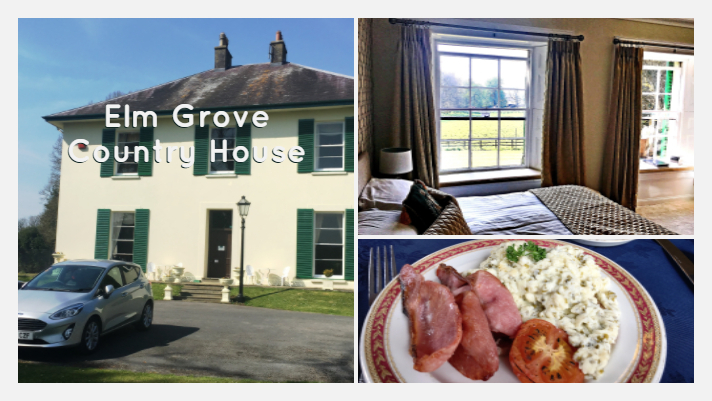 I stayed for a couple of nights at Elm Grove Country House, a most welcoming hotel owned by Alan and Jane Rees-Baynes in the pretty village of St Florence. My large, airy room overlooked a meadow with a couple of horses grazing contentedly. At breakfast Alan recommended I try their Seaweed Scramble, which was both delicious and reassuringly healthy. 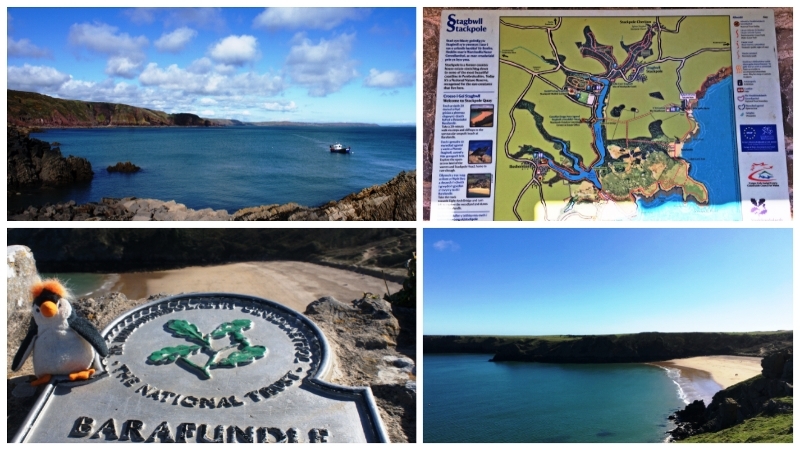 I only had one day for sightseeing but I managed to squeeze a lot in … Pembrokeshire is crammed full of interesting sites and lovely scenery so I didn’t have to travel far to get both. One of the finalists from the previous evening was the Talking Tapestry of Langum. It sounded intriguingly quirky so I crossed the bridge from Pembroke Dock and squeezed along narrow country lanes to see it. ‘It tells the story of the village of Llangwm in Pembrokeshire and the arrival of Flemish invaders and settlers in the 12th century. 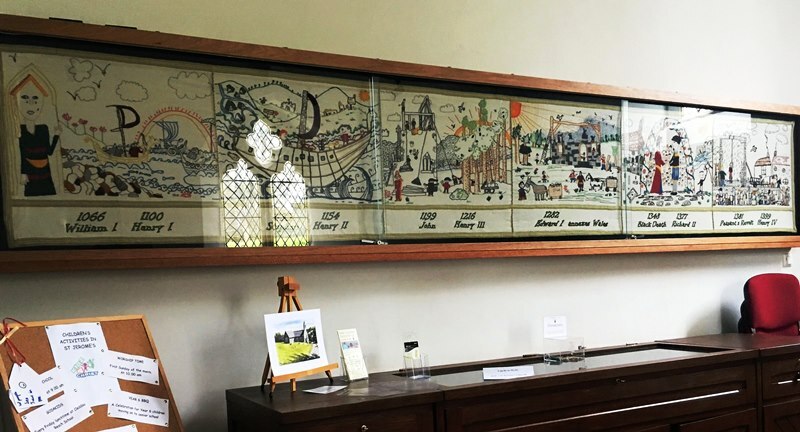 The tapestry was a major achievement of the Heritage Llangwm project which also paid for much-needed building work at St Jerome’s Church, Llangwm, where the tapestry is now displayed.’ It’s a relatively new exhibition and currently there’s not much info on display. However, I bought the advertised App which gives plenty of historic detail. 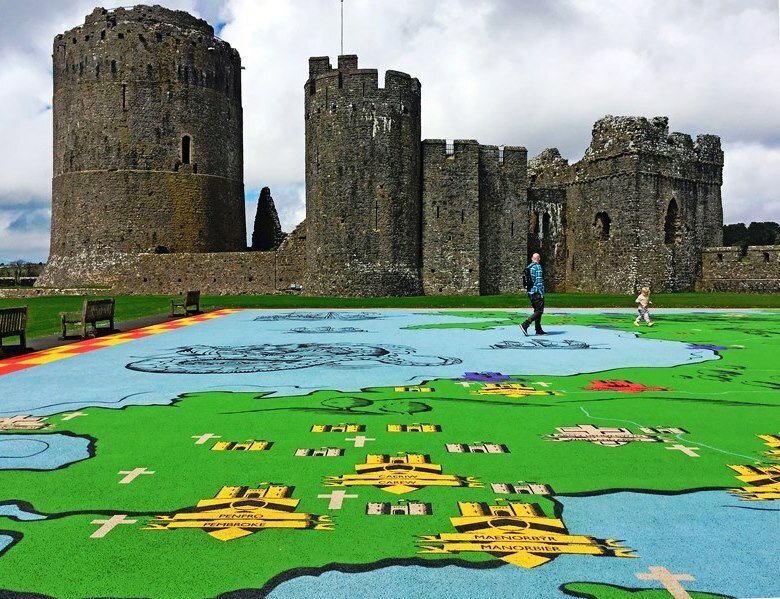 Did you know that Pembroke Castle was the birthplace of Henry VII and therefore closely linked to all future British monarchs? Howard, our very knowledgeable guide for the excellent FREE guided tour (castle entry £6), gave a detailed history of one of the finest Norman castles in Wales. 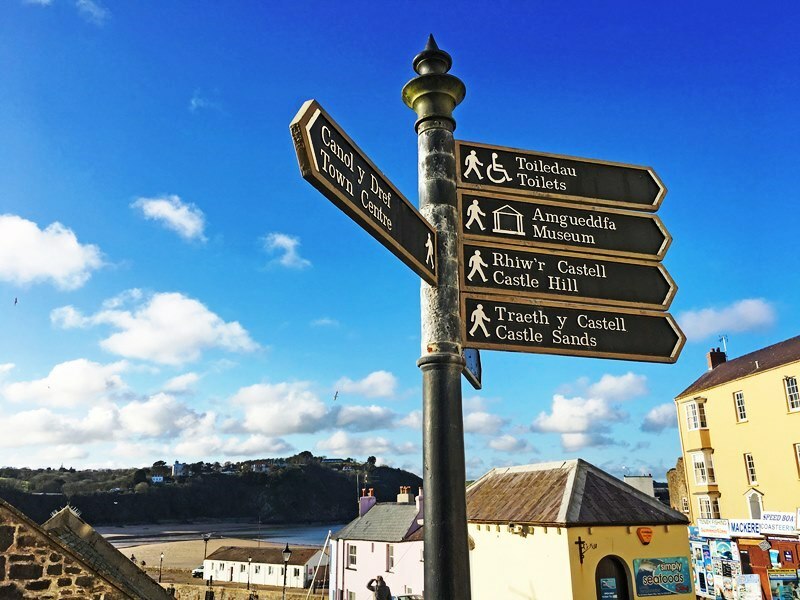 Carefully restored but still retaining its romantic ruined appearance, Pembroke Castle has informative exhibits, an impressive Great Keep, a huge Map of Wales and The Wogan, a large cavern with a watergate overlooking Pembroke River. This relatively small seaside town packs an engaging touristic punch, with two sandy beaches, off-shore islands and a very photogenic fishing harbour. There’s plenty of accommodation to suit all budgets, some interesting shops, a museum and the Tudor Merchant’s House plus loads of options for eating and drinking. After a wander through the Five Arches, the only remaining ancient Town Gate, down charming little lanes and along the palm-lined promenade, I ended up at the very popular Hope and Anchor for an early dinner. 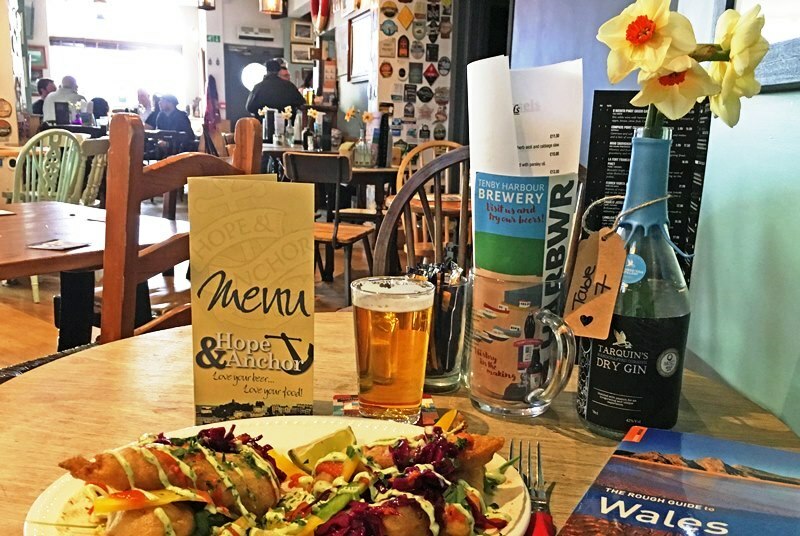 The pub hosts a fine selection of local ales and a decent menu of good pub grub. I had the Tenby Tacos, a big platter of ‘four fish fillets in lightly spiced batter, fluffy-bunny (???) hot sauce with garlic herb mayonnaise, cabbage slaw and chunky chips. Perfect with a glass of Harbwr Tenby Brewery MV Enterprise beer. 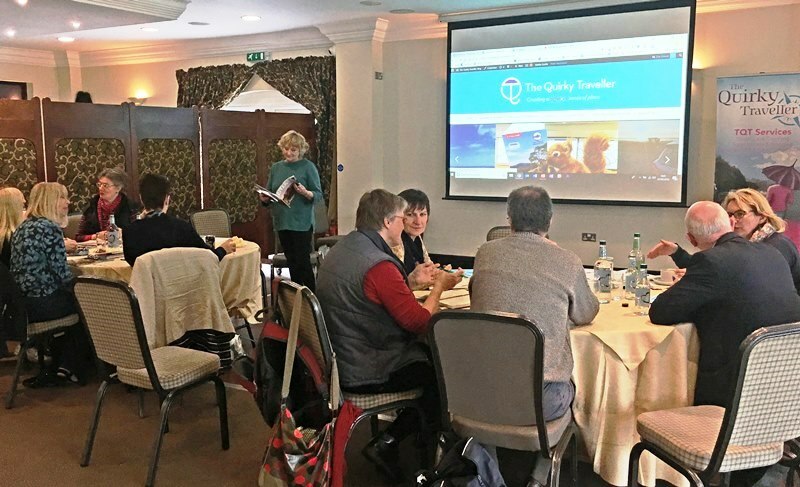 And finally … I ran two workshops on Blogging and Travel Writing which were well-attended by local accommodation providers and other people connected to the tourism and creative sectors in the area. 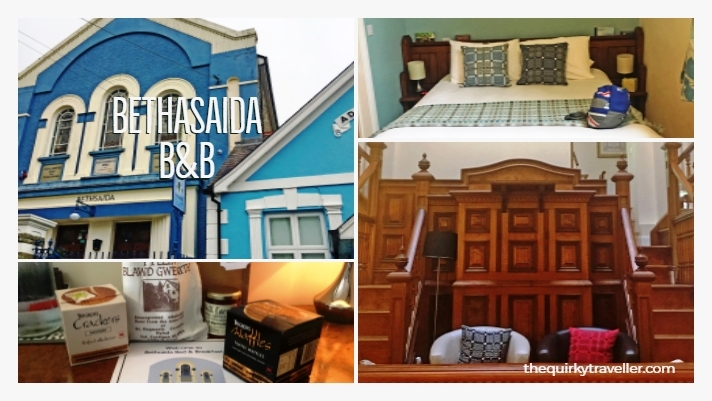 I drove over to the north coast and stayed at the very quirky Bethsaida Bed and Breakfast in St Dogmaels near Cardigan. Owners Tony and Jo have lovingly converted this Baptist Chapel into a unique place to stay. The original pulpit area is the main feature of the entrance and each room is named after original stained glass. Mine was Mawl = Praise and there was a welcome gift of local treats on the bedroom table. Jo recommended the The Ferry for dinner; their fish pie was truly scrumptious, including prawns, salmon, cockles, smoked haddock and laverbread with seasonal vegetables and new potatoes. Many thanks to Dennis O’Connor, Liz and team at Pembrokeshire Tourism for giving me such a warm welcome and to all the lovely people I met. Everyone is so passionate about this gorgeous part of Wales and it’s easy to see why. I very much hope to return to explore further afield. 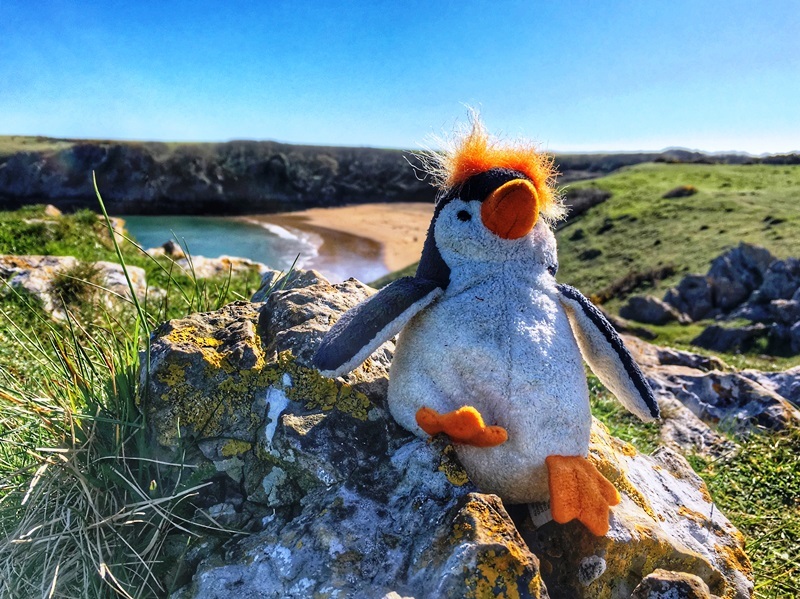 You can find out more about Pembrokeshire Tourism here. You do get about. Think we visited the north coast of Pembrokeshire once when we were on holiday at Back Rock Sands. Certainly looks like a lot to see and do. And you looked like you enjoyed hosting the Awards. 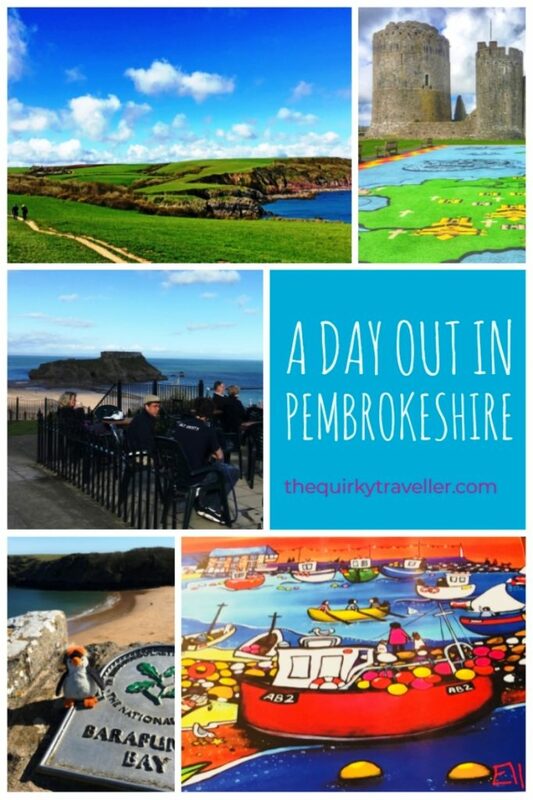 Great article Zoe….captured all that is good and great about Pembrokeshire! A riveting read. If I didn’t live here I would want to visit! Thank you again for hosting our awards evening so supremely well. A wonderful occasion for all finalists! Cheers John, I certainly did enjoy hosting the awards and it was great to have time to explore a small part of Pembrokeshire. Really enjoying discovering some new places to visit in Wales. Never been to Pembrokeshire – we mainly visited North Wales when I was younger. Tenby looks really nice. You are a very inspirational lady we love your blog. The Pembrokeshire coast is one of our favorite UK destinations, on the right day the coastal walk is unrivalled we are about to head on a 4 week road trip in our adventure bus starting off with Cardiff and South wales before working our way down into Cornwall. This will be our longest trip to date and a practise run for our 3 month trip down to Morocco this winter. We will be documenting it along the way and hope we can make it half as interesting as your travel blog. Keep up the good work!